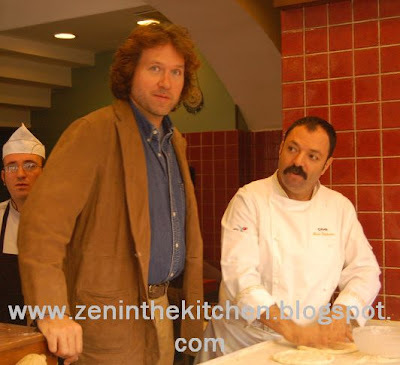 I was very fortunate to work with Chef Michael Smith and the film crew (all wonderful people, director Herrie ten Cate, supervisor producer Dugald McLaren, camera person Dean Skerrett ve sound magician Bruce Thomsen) in Istanbul. I was chosen to be the "fixer" for their Istanbul filming for the tv series CHEF ABROAD. This program is produced by Ocean Entertainment and is shown on Canada Food Network. Not only there but at 70+ countries worldwide. We filmed at various locations. One of the places we filmed at was Ciya Kebap, a worldly known restaurant in Istanbul. Owner of the restaurant Chef Musa Dagdeviren showed us many different natural leaveners that are used to make bread. We loved all the bread he made for us. I do hope that readers of this blog will be able to watch this program since it shows many aspects of Turkish hospitality and the variety of breads and wonderful foods (and a drink) made of wheat/wheat flour.